"I happily used truffle oil for several years (even, embarrassingly, recommending it in a cookbook), until finally a friend cornered me at a farmers’ market to explain what I had should have known all along. I glumly pulled all my truffle oil from the restaurant shelves and traded it to a restaurant down the street for some local olive oil." The oil tasted fine until the truth was revealed! If it tasted good for all those years, maybe it doesn't actually matter if it's entirely real truffles? Maybe it just tastes good? I actually think that truffle oil still tastes fine, even though I know that it might not only be flavoured with 100% pure truffles. It's strong and easy to over-do, so a light touch is required. But sometimes it tastes really fantastic, especially with lots of fat and starch. 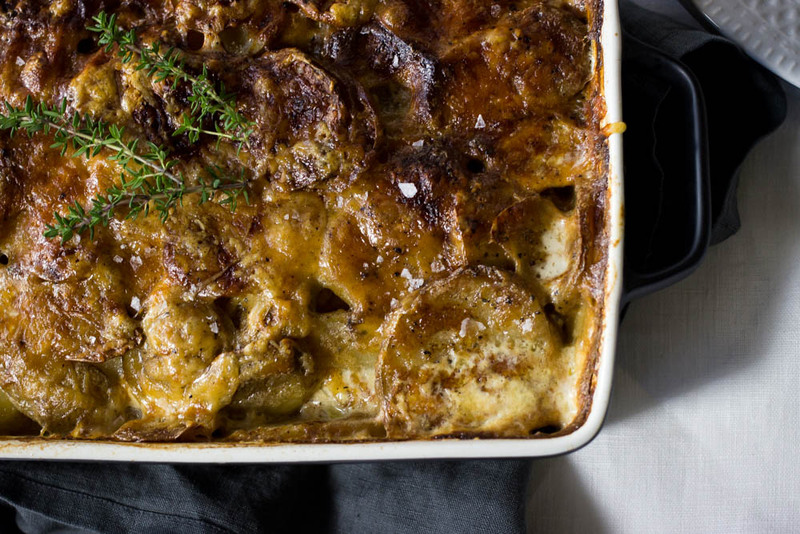 Like in this creamy, rich potato gratin, with a crispy Gruyere top. Heat oven to 350 F. Heat cream, milk and stock until just simmering. Remove from heat and add truffle oil. Lay out potato slices in a 9x13 pan, dabbing with dots of butter and sprinkling over garlic slices as you go. Pour the cream mixture over potatoes. Season with salt and pepper, and sprinkle cheese on top. Bake for about 1 hr, or until cream is thick and bubbly and cheese is golden brown.